Tai Chi postures have now been designed for wheelchair users to bring the Chinese martial and healing arts to people with physical disability. Thirteen specific postures have been put together which can be practiced while seated for people who need simple upper body exercises. “Tai Chi transforms the wheelchair from an assistive device to a tool of empowerment and artistic expression” says Zibin Guo who collaborated with the China Disabled People’s Federation and the 2008 Beijing Paralympics Committee on the project. “It lifts the spirit and gives practitioners a sense of command of space”. The 13 postures incorporate 13 of the 24 Tai Chi movements and can be seen on YouTube. Tai Chi has been part of Chinese traditional medicine for thousands of years but has not been an accessible form of martial arts therapy or exercise for those with disabilities. Surveys show that up to 73pc of people with disability have no or infrequent physical activity which in turn can contribute to lower self-esteem and depression. 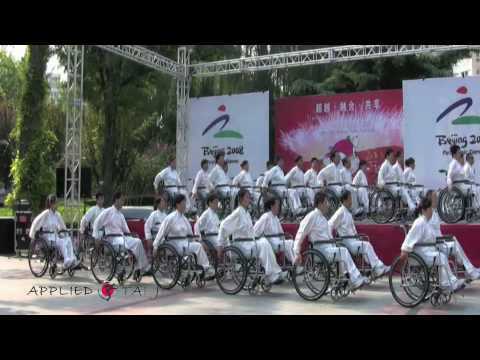 Wheelchair Tai Chi movements allow a wide range of lower back and hip movements, says Dr. Guo. Also, the movements help promote upper body mobility and internal circulation. Vertical and horizontal circles improve and stimulate the rotation and range of motion for the torso, waist, back, shoulders, arms and wrists. “The slow, guided muscle movement has a way of helping to reinforce the muscle patterns that may not have been present before,” says Dr. Glen F. Haban, a neuropsychologist at Siskin Hospital for Rehabilitation in Chattanooga. The study is published in Technology and Innovation – Proceedings of the National Academy of Inventors.